Sterling silver initial charm necklace available in silver or rose gold. This pretty necklace has a delicate sterling silver trace chain, available in childrens size and standard size. A special, personal gift. 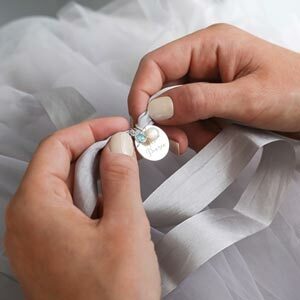 The engraved charm is prepared by our experts in the studio and added to the chain of your choice. 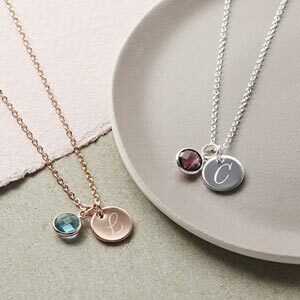 Why not add a special message onto the back of the initial charm to create a unique gift. As stated in the terms and conditions, any items personalised with engraving cannot be returned. Ordered this in rose gold and silver and both are lovely. I didn't ever receive the above. Instead, I received a personalised 'Sia' chain which was not what I had ordered. However, the quality was absolutely awful and the pendant was completely scratched. 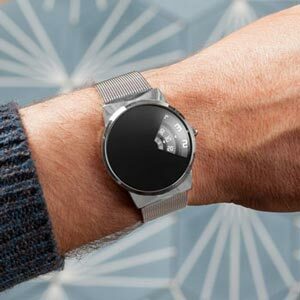 They look lovely, solid, a good size and durable on the website and on social media, but in reality, they're... Read More. I didn't ever receive the above. Instead, I received a personalised 'Sia' chain which was not what I had ordered. However, the quality was absolutely awful and the pendant was completely scratched. They look lovely, solid, a good size and durable on the website and on social media, but in reality, they're tiny, flimsy and very poor quality. I would never purchase anything from this brand again and would never encourage anyone else to do so either!